Hyundai is the latest brand to use social media to tease its five million dollar ad campaign ahead of the Super Bowl to try an generate some buzz before the big game. Hyundai teased its Super Bowl ad during the NFC and AFC championship games on Jan. 21st and on its social media channels, according to an Adweek report. The teaser signals that Hyundai will repeat the theme of last year’s ad, “A Better Super Bowl,” where it surprised three American service members overseas by virtually reuniting them with their families who were attending the game. The footage was edited into a 90-second commercial that aired after the game. 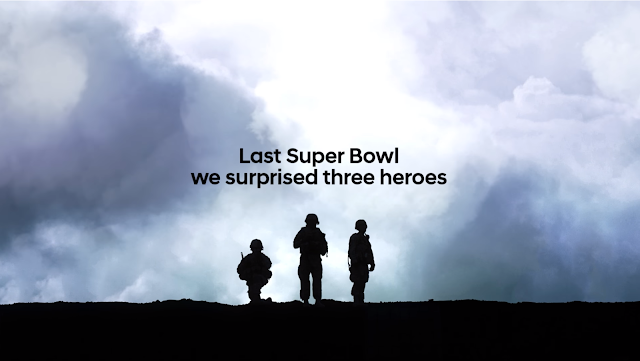 Hyundai’s teaser for this year’s ad opens with silhouettes of three soldiers, followed by an on-screen message, “Last Super Bowl we surprised three heroes. This year we’ll surprise millions. And you might be one of them. See how during Super Bowl LII.” How is Hyundai planning to do that? You'll have to watch their Super Bowl spot to find out!